Familiarize yourself with the cities that our indie game studios call home. Making games is hard. But indie developers all over the world are doing it anyway. Indie game developer Adriaan de Jongh (Hidden Folks) travels the globe from Prague to LA to Montreal and finally Melbourne exploring the intricacies of what it means to be an “indie game developer” in today’s game industry. Adriaan talks to Amanita Design in Prague where he learns why some developers chose to do things the hard way. From there our hero heads to Montreal, where despite the cold weather, he discovers one of the tightest-knit (and biggest) indie game development communities in the world. Heading from the north down to the sunny Californian streets of Los Angeles, Adriaan meets developers championing the concept of “Gemütlich,” through games. Finally, we end our quest in Melbourne, where indie developers are banding together, taking a radically new approach to game development. Watch the full series below and get to know each studio’s home location a little bit better with our Twitter city guides. Our four-part series begins in Amsterdam as Adriaan de Jongh (Hidden Folks) prepares to travel the globe and find out what drives indie developers to make their games, their way. First stop: Prague. Adriaan meets up with Amanita Design — makers of Samorost 3 and Machinarium — and learns about the dedication and detail that goes into their unique style. Adriaan’s second stop is Montreal, where he visits Compulsion Games, KO_OP Mode, and Kitfox Games to see what it takes to create their art. It isn’t always easy, but a legacy of game development and a tight-knit community make Montreal one of the biggest (and coldest) indie hubs in the world. Moving from snowy Montreal to sunny Los Angeles, Adriaan chats with Night School Studio, the team behind Oxenfree. Blending narrative storytelling and unique mechanics, Night School sets out to make an emotional connection with their players — much like Adriaan tries to connect players physically with his own games. The final episode takes place in Melbourne, Austrailia, shining a light on the city’s thriving indie scene. The Arcade is a collaborative workspace in Melbourne that’s home to 30+ indie studios. In his fourth and final stop, Adriaan discovers that it sometimes takes a village (and good coffee) to overcome the hurdles of game development. And that’s it! 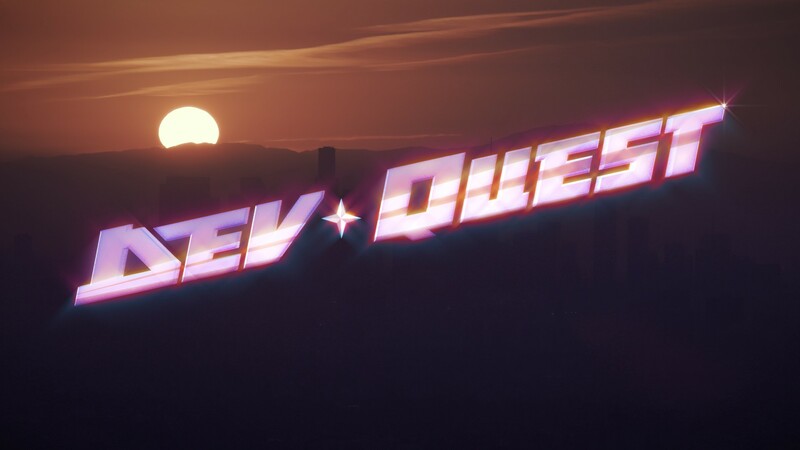 We hope you enjoyed DevQuest as much as we enjoyed making the series and meeting indie game devs all over the world. Which city and episode is your favorite? Do you have any additions to our above points of interest? Tell us what you liked on Twitter. Learn more about game development on Windows 10 here. Everything you need to know to develop great apps, games and other experiences for Windows.